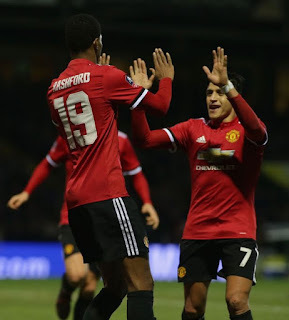 Manchester United manager, Jose Mourinho, has said Alexis Sanchez’s maturity can be the difference for his team and that Marcus Rashford must learn from his new team-mate. Sanchez, who moved from Arsenal on Monday, made his debut in the 4-0 victory at Huish Park, with a fine assist for Ander Herrera’s second goal. While he and Rashford started together, Mourinho has hinted that the England striker will have a role off the bench for now, due to his nerves. “These matches are difficult if the attitude is not correct,” Mourinho said. “In the first half they gave us a difficult time, pressing and aggressive on the ball and on the shinpads. “I could hear Darren Way on the touchline, he knew what he was saying, they were organised. “But in the second half we had control of the game and had more space and more quality, we killed the game. “Alexis Sanchez is a fantastic addition, everyone is happy that he comes. Good players want good players. The question is always which one is going to be left out, it is not about that for us. “We have a fantastic group of attacking players and he is another one with more maturity and experience.